Shawls and wraps are possibly some of the most versatile pieces in your wardrobe. They can really add pizzazz to an otherwise plain outfit, and even add that extra fine layer of warmth for either air-conditioned rooms or a chilly night. Shawls come in literally all shapes, sizes, colors, and fibers. Knitters and crocheters LOVE to make them, as they're a great way to test out a new pattern or foray into something more advanced than they're used to. You can make them in any which yarn you please...from bulky wool to the finest cotton, there's sure to be something to please everyone. They're really not just for special occasions, such as weddings, or parties and such, because you can wear them just whenever like! They look equally as great over a sweater & pair of jeans for a trip to the store, as they do over a fancy dress for a dinner party. And, the colors and styles? Well, the choices are about endless! This crocheted shawl is one of my designs - "Chrysanthemum" - photo courtesy of Premier Yarns. Wraps, in my opinion, are more likely to be rectangular in shape, just like a very wide scarf (no, they're not just some meat ,cheese and veggies, bound by a tortilla, and sold in a deli). This simple shape makes them SUPER easy to make if you're knitting, crocheting, or weaving. Again, they come in all different fibers - everything from cotton to wool, silk to alpaca, polyester to cashmere. There are choices for every budget if you know where to look, and of course, I'll help you with that too (if you're not into making your own). These cozy or simply decorative accessories can be simple to make or quite challenging depending on the craft you choose. And, of course, deciding how to wear them in a more interesting way can be a bit of a challenge, so I have a few videos you might enjoy watching, which will hopefully give you some ideas of how to wear your shawls and wraps. I love them! I'm sure you'll learn to love them too! 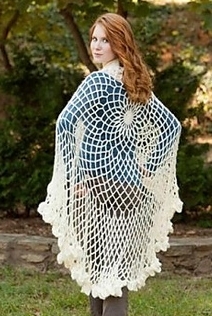 This crocheted wrap is also one of my designs and it appeared in Interweave Crochet in 2008 - Photo courtesy of Interweave Crochet 2008.